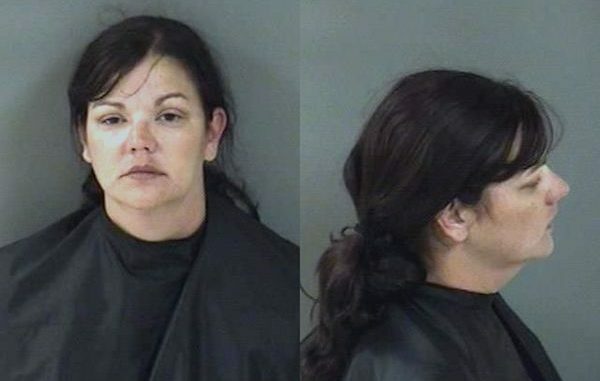 April Decker Alaimo of Vero Beach was arrested Friday night on a charge of DUI. VERO BEACH – A 33-year-old woman was arrested on a charge of DUI at Filthy’s Bar after she ran her car through a chain barrier and threatened to run people over, according to the Vero Beach Police Department. The incident took place on Friday morning at approximately 1:23 a.m. after a woman attacked a bar manager at Filthy’s Bar located at 1238 16th Street in Vero Beach. As officers arrived, they saw the bar manager holding April Decker Alaimo, of Vero Beach, to the ground. The manager said he and Alaimo were in an argument over her driving after she had been drinking that night. Soon after, Alaimo got into her vehicle and ran under the chain barrier that was blocking off part of the rear parking lot at Filthy’s. Alaimo allegedly threatened to run people over during the incident, according to the report. “I did see what appeared to be fresh scratches that ran from the front of Ms. Alaimo’s vehicle all the way to the trunk, the damage appeared to be consistent with marks from a chain,” the officer said in the arrest affidavit. The manager said he followed Alaimo’s vehicle while calling the police. But when Alaimo saw that she was being followed, she exited her vehicle and “attacked him” and that’s when he held her down to the ground until officers arrived, the report said. Vero Beach Police say Alaimo had an alcoholic beverage emitting from her breath, and she slurred her words while speaking. Alaimo refused to conduct standard field sobriety tests for police, and she also refused a breath test. Police found out that Alaimo already had a prior suspension on her driver’s license for refusal to submit to a lawful test of breath, urine, or blood. Alaimo was arrested and transported to the Indian River County Jail. She has since been released on a $1,500 bond.